As the government develops the aid-related aspects of its new foreign policy White Paper, it would do well to take heed of some clear and instructive trends in the articulation of aid policy frameworks by other donor countries in recent years. Donors’ aid policy narratives generally place less emphasis than they used to on country-based aid in the form of traditional economic and social development programs. Humanitarian aid is more prominent, and accounts for a larger share of spending. Narratives tend to rest on two or three of the following pillars: assistance to the most fragile countries, including conflict-affected states; responses to thematically-defined global, regional and national challenges; and direct engagement with the private sector to promote trade and investment. Where country-based assistance still figures beyond the category of the poorest and most fragile states, the emphasis is now much more on support for domestic revenue collection and public expenditure management in middle-income countries, including the development of social protection systems. Several factors have driven the evolution of aid policy narratives away from what was previously a two-world, ‘poverty reduction through sustainable development’ storyline. One is the emergence of new international finance providers who tend to specialise in public infrastructure and have some competitive advantages over traditional donors in that domain. Another is the graduation of almost all but the least-developed countries to middle-income status, combined with the ever-increasing importance of private financial flows to middle-income countries. A third, arguably the most important, is the level of public concern in donor countries—superimposed on a perennial background of aid scepticism—about the impact of transboundary problems such as climate change, irregular migration and communicable diseases. Given these shifts in the global context for aid, already reflected in other donors’ policy frameworks, it is reasonable to question whether Australia should continue to place as much emphasis as it does on bilateral aid relationships and allocations. Certainly, it makes sense for Australia to maintain bilateral aid relationships with Papua New Guinea, the Pacific island countries and Timor-Leste—countries with high dependence on Australian aid. Beyond that, there is unlikely to be any significant downside in shifting to an aid program organised along primarily thematic lines. 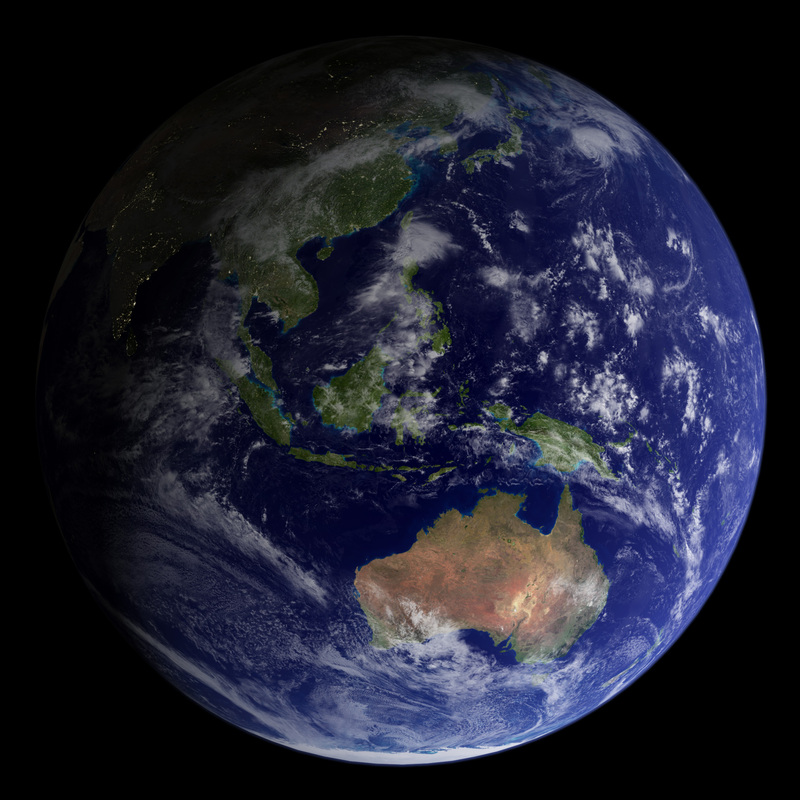 The advantages of a thematic approach are that it would allow Australian governments much greater flexibility to address global and regional problems, provide a capacity quickly to transfer resources to wherever they can best be utilised, and potentially also deliver economies of scale and greater impact through a concentration of resources and expertise in central, thematically-oriented delivery mechanisms. As most of the developing countries of Asia now have very low levels of aid dependence, and a diversity of financing sources, they are unlikely to voice any serious objections to a shift from country-based to thematic aid allocation on Australia’s part. In fact, as was remarked here and as is evident from the trends shown in Figure 1, the withering away of country programs has arguably already begun outside Papua New Guinea and the Pacific. Few if any protests have been heard. Source: Australian government budget papers. 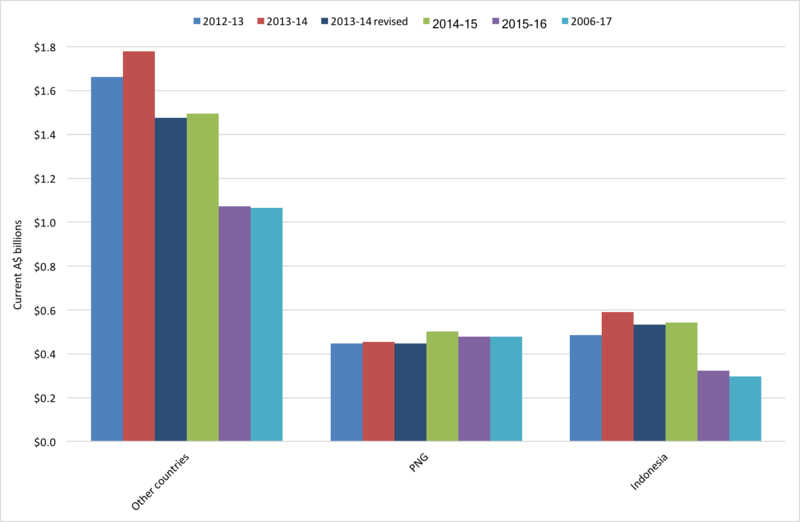 Two figures are shown for 2013-14: the allocations contained in the Labor government’s 2013-14 budget and the revised allocations following the incoming Coalition government’s mid-stream aid budget cuts, which were applied in early 2014. Single-country investments should continue to be made, because experience shows that they are generally more effective than multi-country programs. However, they could be made with much greater cross-program coherence without the straitjacket of country-based funding envelopes and with the backing of strong thematic programming mechanisms at the centre. As for the selection of thematic priorities, Australia is a middle-ranking donor with, currently, limited budget flexibility and administrative capacity. In these circumstances, it makes sense to focus resources on humanitarian aid, selected thematic objectives, some public policy partnerships in areas where Australia has particular expertise, and carefully targeted private sector engagement backed by risk-reduction financing. Australia’s use of the multilateral aid system remained fairly stable at around A$1.7 billion per annum from 2011 to 2015 (in constant 2014 prices). However, the balance between core and earmarked funding shifted substantially. The level of core funding was around A$270 million higher in 2015 than it had been in 2011—accounting for 54% of total Australian funding through multilateral organisations, as compared with 36% in 2011. While this provides welcome flexibility to receiving agencies, it also represents a loss of Australian leverage. Australia has obvious scope to do more—for example, incentives for Australian firms to invest more in the poorer and more fragile developing countries of Asia and the Pacific. A tighter focus on humanitarian assistance and the several pillars of development assistance outlined earlier—assistance to our fragile neighbouring states, action on certain thematically-defined challenges, and direct engagement with the private sector—would be likely to improve both the effectiveness and communicability of Australia’s aid effort. That’s why, in my contribution to the Development Policy Centre’s submission to the White Paper consultation process, I’ve recommended the following. The government should undertake to refresh its aid policy framework from about mid-2017, three years after the adoption of the existing framework, with a view to enhancing its relevance, its flexibility and its usefulness as a tool for communication and accountability. As part of this process, the government should consider shifting away from country-based allocations in most cases and defining a core set of thematic priorities on which Australia is particularly well placed to deliver. It should also assess the merits of creating new institutional arrangements to deliver on certain priorities, including international medical research and outward investment promotion. As a proportion of aid provided by all countries that report their assistance to the OECD (which includes some non-member countries), humanitarian assistance increased from 5.6 per cent in 2002 to 11.2 per cent in 2015. A widely read 2012 policy paper by Homi Kharas and Andrew Rogerson, Horizon 2025, rated the ‘exposure’ of major bilateral donors and multilateral institutions to shifts in the context for aid. On their methodology, development agencies did not fare well unless their resources were largely allocated to (a) poor, fragile or conflict-affected states and (b) global public goods. Australia’s exposure—essentially a measure of its risk of irrelevance—was ranked at 11 among the 34 governments and multilateral agencies considered. The London-based Overseas Development Institute is currently refining a measure of donor ‘resilience’ along the lines of the measure originally developed by Kharas and Rogerson. Do we have any examples of bilateral or multilateral donors where this sort of approach has worked well? The most significant eg seems to be the World Bank and I don’t think that is one that many would say has been a real success. Would moving aid from bilateral programs to regional/thematic/ multilateral programs also probably work against the government’s focus on more closely aligning foreign policy objectives and aid program objective?